David Villa poses with Queens College soccer players and students. FLUSHING — One of the world's greatest players is opening his soccer academy at Queens College to help train future stars in the borough. 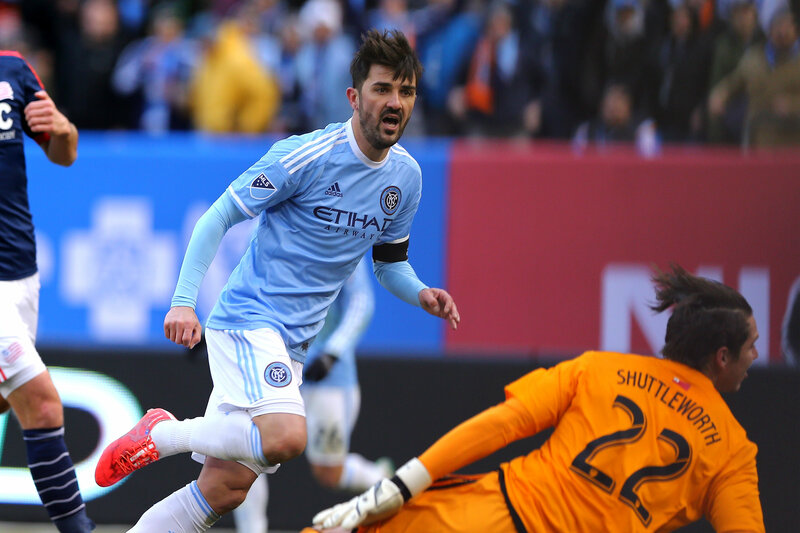 David Villa's DV7 Soccer Academy will open this summer through the college's summer camps, offering the Spanish training methods from "El Guaje" himself. Villa — the top scorer on the Spanish National Team and the captain of the New York City Football Club — said it's a "special opportunity" to bring the camp to the diverse borough of Queens. He opened his first camp last January in Bayamon, Puerto Rico. But it was friend of Villa and soccer fan Assemblyman Francisco Moya who facilitated the academy's arrival in Queens. "[Queens is] one of the most diverse districts in the entire country, where you have over 172 languages, over 200 nationalities," he said. "David has the vision that you can all learn the beauty that we call football. And I think that's what's really going to grow and emerge here in Queens College." The college's president, Felix V. Matos Rodriguez, said the camp will be a tremendous opportunity for players in Queens to learn with a pro. "Over the years, Queens College's summer camp has enriched the lives of tens of thousands of children," he said. "We are honored that David Villa's DV7 Soccer Academy sees the value of having a partnership with the college." The camp will be run by Josep Gombau Balaguer, the former director of the Football Club Barcelona Escola, but players will get hands-on training with Villa. Villa, who posed for photos with dozens of students and players at the announcement at Queens College Wednesday, said his goal was to create talented players. When asked if the next David Villa could come out of Kissena Boulevard, he said he dreamed bigger. "I hope not only one David Villa, why not a lot of David Villa? And why not better than David Villa?" he said. "This is the target, and we're hoping in the future to graduate very good soccer players that are in our academy." There will be two sessions, running first from July 25 through July 29 and again from Aug. 1 through Aug. 5. It's open for children between the ages of 5 and 16 and costs $695 for each week-long session. For more information, visit their website.